I’m a little peckish today. No big deal, I just skipped lunch. I’ve never truly known hunger, never had a legitimately empty belly. Sure, I groused as a teenager in the summertime, moaning “I’m hunnnnngggggrrrryyyyyyyy” as if I was the most put-upon soul in the world…but so many are truly hungry. Starving. Malnourished. Dying of hunger. Snickers has one of those no skin off my nose programs where we can help, almost effortlessly. Their new “BAR HUNGER: It Tastes Good to Do Good” program has newly printed candy bar wrappers. Inside the wrapper is a code. Once you’ve eaten your sweet snack, you enter that code on their website, and they donate a meal to someone in need. Up to 3.5 million meals are going to be donated while the program lasts (through the end of November). Their partner is Feeding America (they used to be known as “America’s Second Harvest”) and their efforts already make a huge difference in this nation’s childhood nutrition and hungry populations. SO a candy bar may not be the best thing for you, but it can do something extra for someone who genuinely needs help. Then pop over to the Feeding America Hunger Action Center to find more ways to help. Thanks for this article! It’s the efforts like this that continue to make a difference. 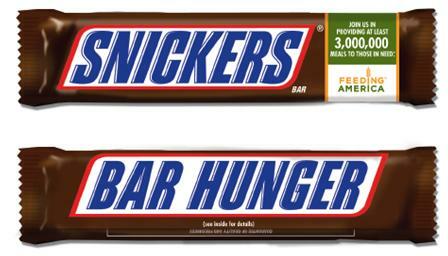 I can’t wait to get my Bar Hunger today! Unfortunately, I was not able to attend this event, but a few of my friends did and they said it was amazing! It was a truly inspirational night. This just wants me to get out into my community and make a difference.